Each day, a number of our church members, who are also photographers, post photos and spiritual commentary, following this schedule: NOTE: To see previous blog entries, access blog archives on the right sidebar. This image from a local farm feed store is mostly for fun, but it might have a few nuggets for thought in there. In general people are fairly careful about what they eat. 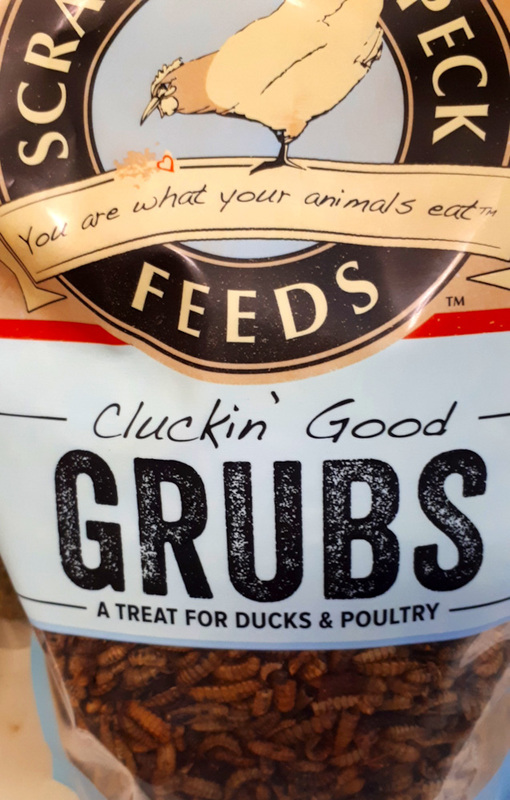 So the thought that what is going into our mouths originally came from grubs is kind of horrifying, or funny, depending on how you look at it. Even vegetarians like myself are likely to have ingested a few undetected bugs in their salads. Fortunately, Jesus is not so concerned with what we eat, but is more interested in our hearts and actions. Let’s rely on Jesus to give us strength to fill our lives with wholesome thoughts and actions so that we can share His love with others. I haven’t had a chance to get up to the tulip fields this year, but this particular shot is from last year’s amazing colors. This view reminded me of a rainbow, with the variety of colors which the tulips line up in. It also reminds me of a promise that God made to the world, and specifically to Noah and his family. I presume that most of you have read this story, and the idea of this promise or covenant wasn’t a new concept to you. That said, how many of us (including myself) think about this promise? I wouldn’t think it’s very often. There are very few times we are concerned with the entire planet being covered in water. But maybe that’s not necessarily what we should be focusing in on. Maybe instead, we should be looking at the fact that God wanted to make a promise to all of mankind. First off, God doesn’t owe us anything. So the actual act of making the promise is an interesting one. If we take away the actual event (flooding the planet), we can see the root of the promise. I feel God wanted to insure that we know He’s there for us, whether that means an actual flood, or a figurative “flood” in our lives, God is there to make sure it doesn’t get too deep. He wants to be our lifeline, no matter what we are facing. 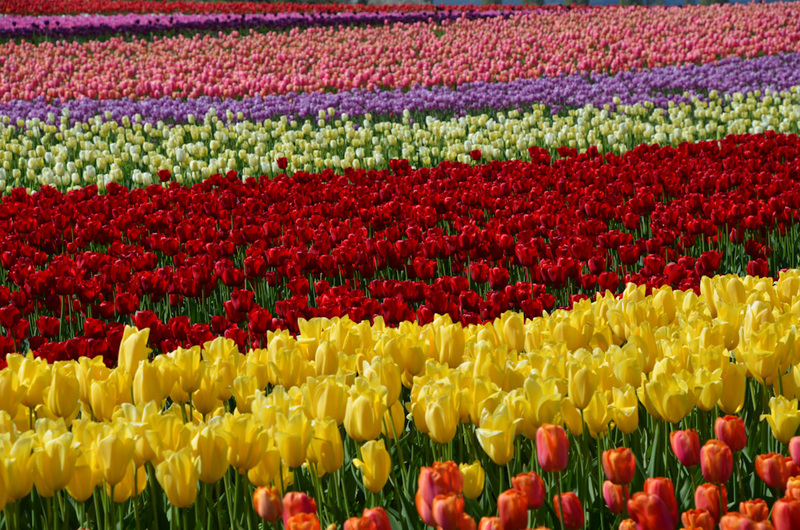 Keep an eye out for the rainbows in the sky, or the other signs of His promise – all the beautiful colors (like these incredible rows of tulips). God’s messages to us can be found everywhere. Our hosts must have had many talents. The dinner they prepared in the primitive setting was superb. Their welcome, both verbally and visually, provided each one with a sense of genuineness and sincerity. But what fascinated me the most was their aura of optimism. It’s altogether quite probable that they swiped the idea from another who also liked it, but the encounter for me was here in the jungle, and I was altogether willing to accept the idea as mine. The setting was somewhere in Thailand not too far from the Mekong River. We had been transported in the back of a modified farm vehicle to this out-of-the-way place where a farming family provided us with our noonday meal. For the life of me, I could never find the place again as hard as I might try. But fortunately for us, the driver knew his way around and returned us safely to the Golden Triangle. 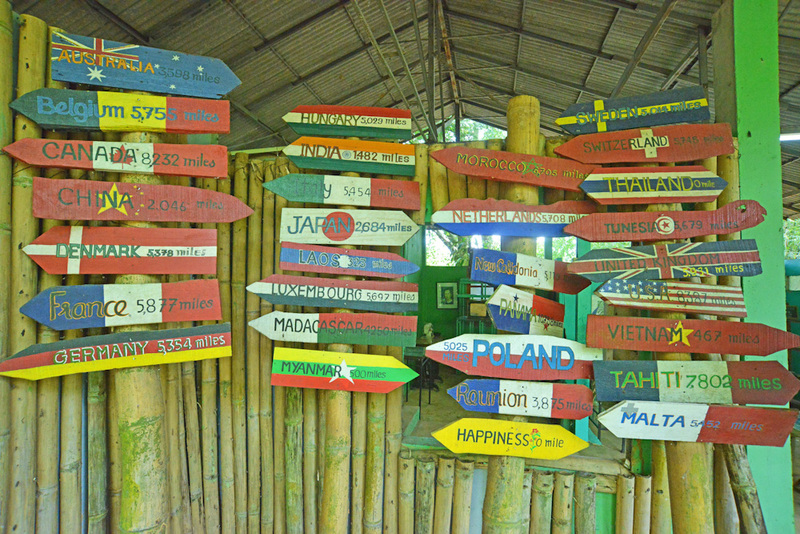 What cemented the belief of their optimism was found exhibited on a hand-crafted display, sheltered by bamboo poles. There, on the steep side of a slope, several booths had been erected which displayed their art work. But there was one that caught my attention. On it, they were smart enough to include the homeland of many of the tourists that might chance their way, including one that informed me we were 8,387 miles from home. The punchline, however, was found on a yellow plank toward the bottom right that simply read, HAPPINESS – 0 miles. 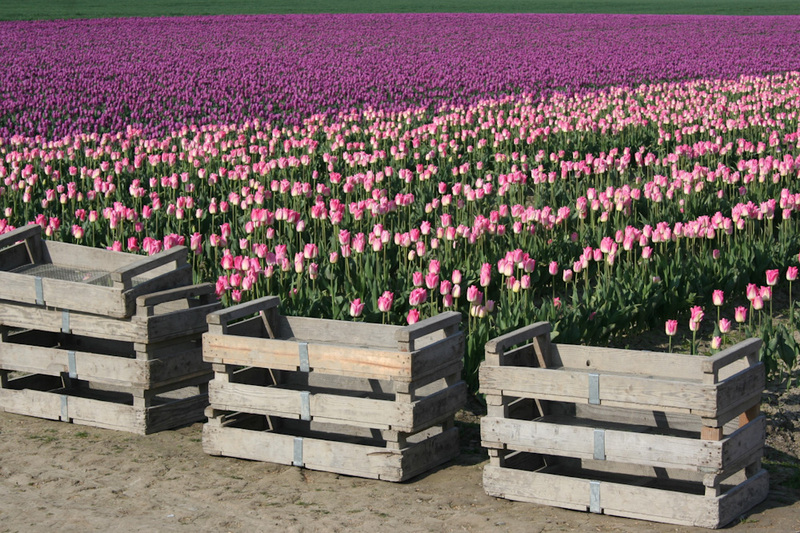 These boxes are for the workers to fill with tulips. This picture was taken a number of years ago, but while the colors of the flowers change and the fields that are planted are rotated, the harvesting is the same. Early Sunday morning Mary of Magdala, Joanna and Mary the mother of James went to the tomb where the body of Jesus had been placed. Bewildered, they didn’t know why the stone had been rolled away and Jesus’ body was no longer inside. Suddenly, two men in dazzling garments appeared. One of the men asked why they were looking for the living among the dead and said that He had risen. Now they were really confused. After thinking, they remembered that Jesus, while in Galilee, spoke about being crucified and would rise on the third day. Wow! He wasn’t dead after all, but alive! They must tell the others. And so they did. The others would not believe the women! While two of the followers of Jesus walked toward the village of Emmaus and talked between themselves, another man joined them on their journey. Not looking at the man, they talked about their friend, Jesus who had been crucified. They didn’t realize this man was Jesus! When they sat down to eat, their eyes were opened. Finally, they recognized this was Jesus! He had risen as the women had said. Then He disappeared. 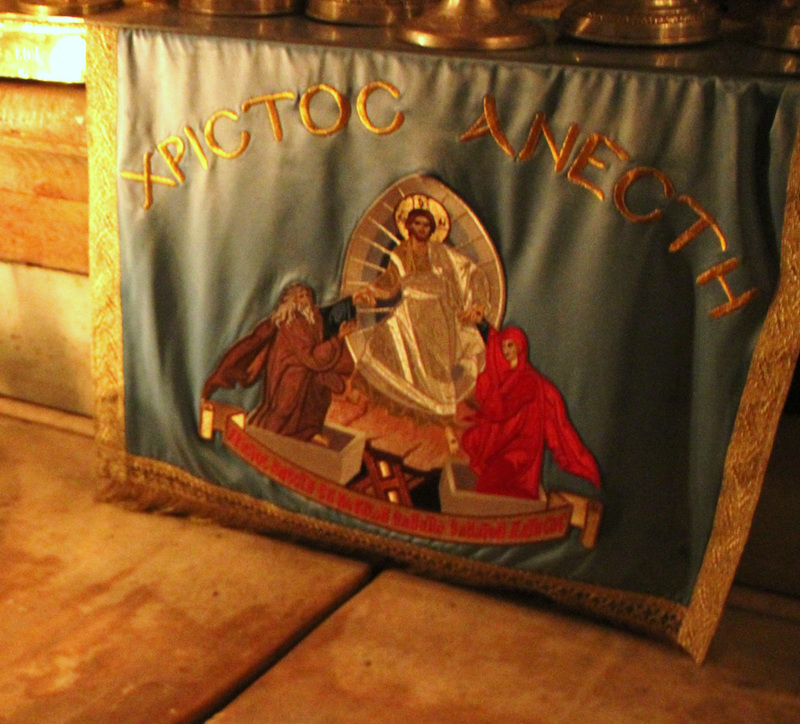 The above picture, showing the risen Jesus, is above His empty tomb in Jerusalem. Today, we celebrate Easter Sunday, thinking of the sacrifice Jesus made for each of us. When death overcame Jesus, He and the others who were crucified needed to be quickly buried before the hour of Sabbath came. Joseph from Arimathaea, a member of the Jewish Sanhedrin but a secret follower of Jesus, was granted Pilate’s permission to take the body of Jesus. In haste, he and Nicodemus, another member of the Sanhedrin and a Pharisee, took the Body from the cross, placed it on a rock slab, washed it and wrapped it with linen and spices according to Jewish burial custom, as grieving women looked on. 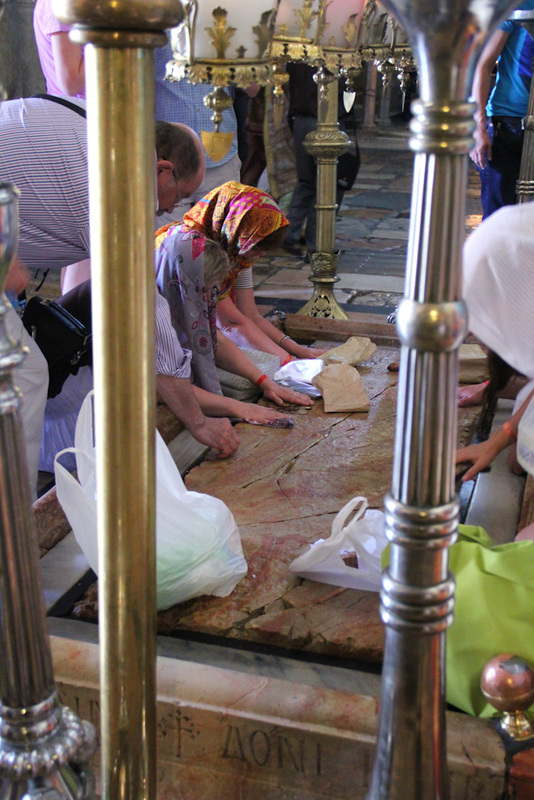 The above photo shows the Stone of Anointing (also called Stone of Unction), where Jesus’s body is said to have been prepared and anointed before burial. (The original, but similar stone may have been replaced by this stone.) Where were the disciples of Jesus? Stooping low, the two men then placed the body of Jesus in the nearby new tomb that belonged to Joseph and rolled a large stone to block the entrance. 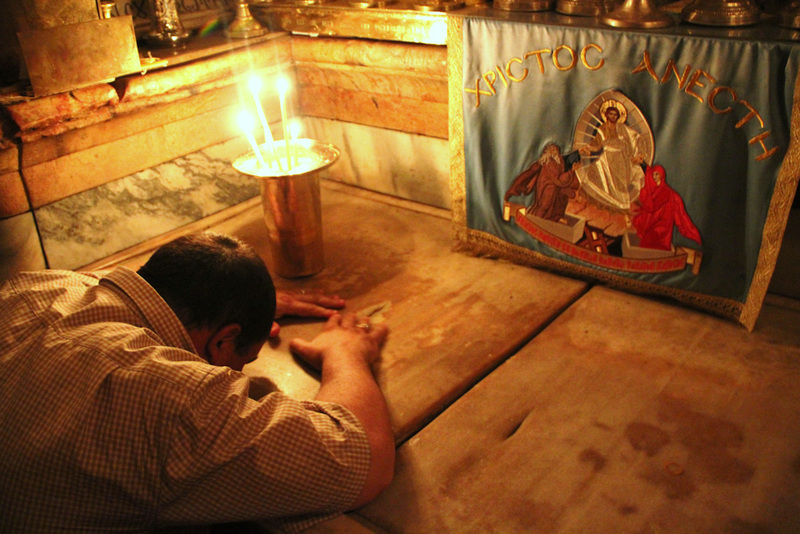 This second photo shows a man bowing over the stones in this tomb, replaced after previous ones were destroyed. Concerned that followers might steal the body of Jesus or that He might rise from the dead as He said He would (Mathew 16:21), Pilate posted guards to watch over the tomb. (Mathew 27:55-66, Mark 15:40-47, Luke 23:40-56, John 19:38-42) Sabbath came while Jesus rested in the tomb. Today, the Church of the Holy Sepulchre in Jerusalem protects these sites. NOTE FROM PASTOR MAYLAN: From the beginning of our church’s Daily Photo Parables until recent weeks, Bev Riter has contributed a weekly photo blog, most often using experiences and photos from the many countries she and her husband Ron have visited. We thank her for her years of wonderful blogs, and for her willingness to let us republish a few of them during this Easter season, thinking more deeply and gratefully of the sacrifice Jesus made for us. 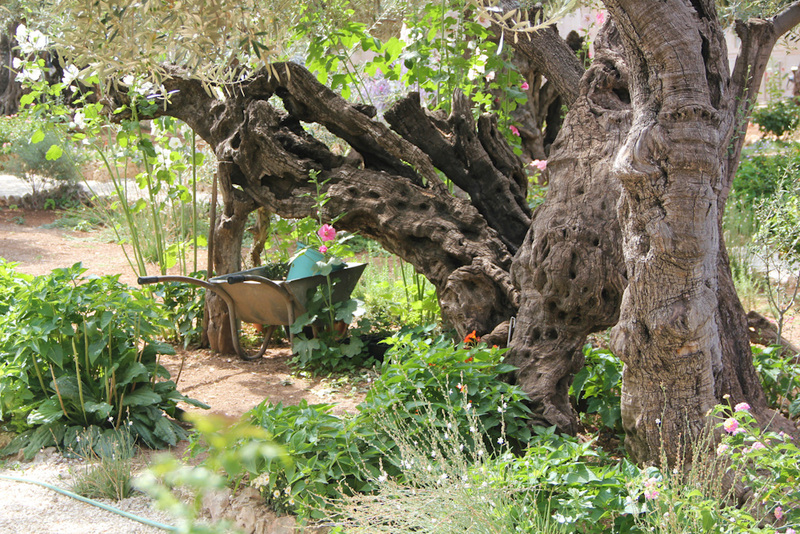 In today’s photo blog we enter, with her, the Garden of Gethsemane.